This is one of the simplest and easiest experiments using Bluetooth module , Android and Arduino. You just need an Android serial emulator, any type of emulator should work for this experiment. I recommend Blue term , you can find this application on your Android Market (Google Play). In this experiment, as soon as you connect your phone to Arduino via Bluetooth, you will see numbers increasing from 0,1,2 and so on. 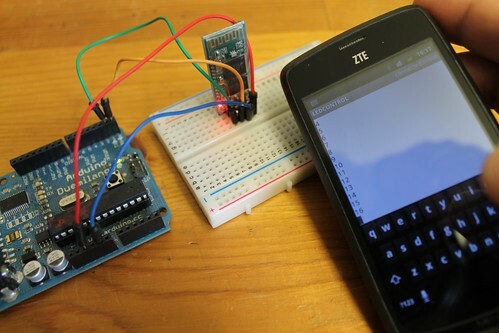 While counting, if you enter a text or number on your phone, for example, ‘abc’ , you will get a message “Arduino received: abc” on your phone screen. This experiment makes the use of a general and low cost Bluetooth module available at Amazon.com. 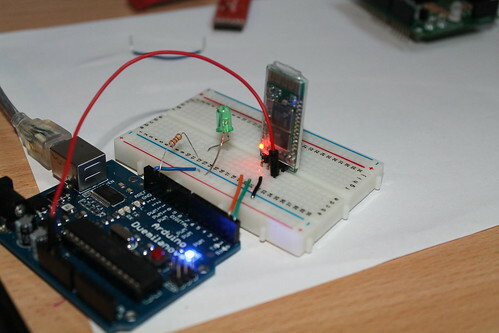 In this image, you don’t see LED connected to Arduino. That is just optional. This image has been taken from the following video.